One of the best parts of my job is telling the UK story — the faculty and students, staff and researchers, who work hard every day to teach in innovative ways, broach new areas of discovery, and serve our Commonwealth. But I’m even more gratified when those behind the creation of that story get to tell it themselves. 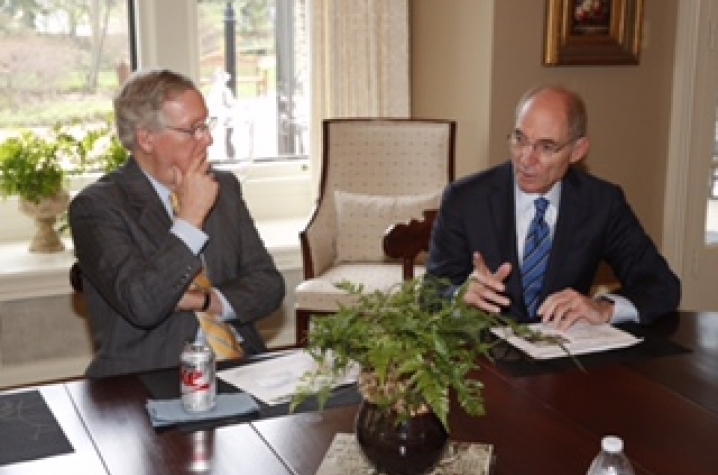 That was the experience this week when several researchers and clinicians gathered around a table at Maxwell Place talking about innovation, discovery and care with U.S. Senate Majority Leader Mitch McConnell. For more than an hour, he listened thoughtfully and asked insightful questions as some of our leading researchers discussed what we are doing in areas ranging from cancer care and research to energy innovation and exploration. His support has been crucial to many of our most important research efforts. 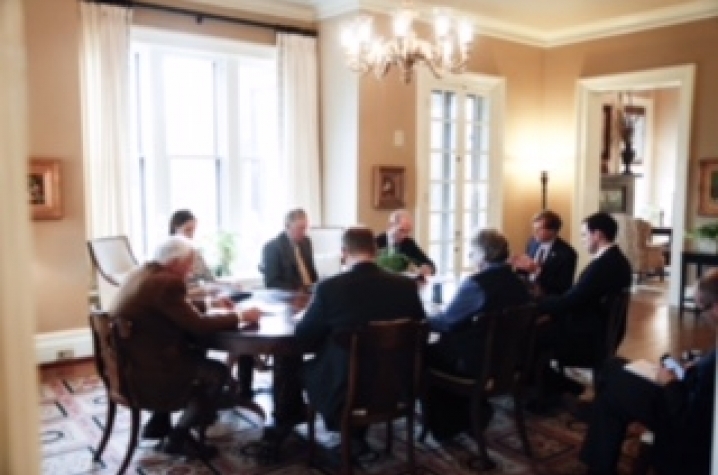 The opportunity to tell the U.S. Senate Majority Leader first-hand about our progress is invaluable. Mark Evers, who directs our NCI-designated Markey Cancer Center, spoke about what our federal designation of excellence means in terms of nearly $10 million in increased funding as well as greater access to clinical trials, the development of new drugs and novel treatments, and increased interventions for screenings for cervical and colorectal cancers. To that end, Lisa Cassis, our interim vice president for research, told Sen. McConnell that a group of UK researchers is focused on poverty, in areas like food security, as we attempt to pull the many levers necessary to address health disparities that exist throughout the state. We were able to cite the 330 funded projects we have in place that address many of these disparities and preventable deaths. Mike Karpf, our executive vice president for health affairs, noted how the transformation of the UK HealthCare system is creating a virtual network of care throughout the region, and increasingly the state, designed to make high-quality primary care more accessible to more Kentuckians closer to home. The most serious and complex of illnesses are then treated at UK HealthCare by physicians and clinicians who, at the same time, are building strong relationships and partnerships with regional and local providers throughout Appalachia and the rest of the Commonwealth. More access to better care is the result. Rodney Andrews, who runs our Center for Applied Energy Research, talked frankly about both the challenges and opportunities associated with coal and its future. He talked optimistically about some of CAER’s efforts in the areas of coal-to-liquids and carbon capture as potential avenues for creating a more sustainable future for this important resource. At the same time, he talked candidly about how the country is grappling with a number of energy issues and how coal must be a piece of a broad range of options in the nation’s energy portfolio. 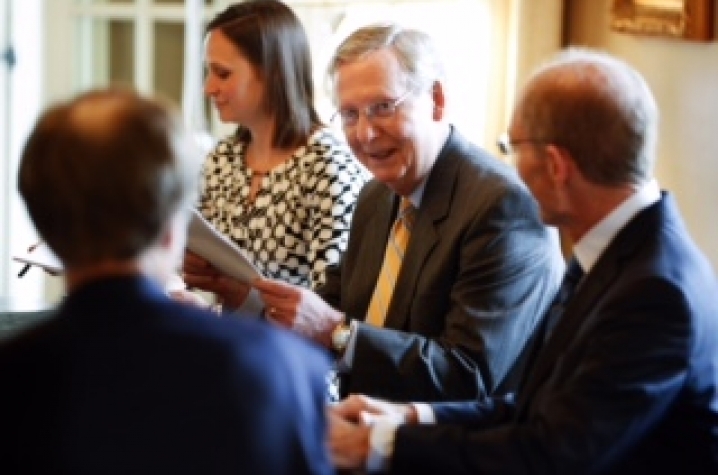 As so many of you know — and as Sen. McConnell deeply appreciates — our depth and breadth as an institution is impressive. On virtually every issue of importance to our Commonwealth, we are engaged and we are leading. That commitment to service on the issues that matter most to Kentucky is part of our DNA. It is central to who we are as Kentucky’s university. I’m glad to be part of a team that tells that story with such conviction and commitment.